International Journal of Research in Health Sciences,2014,2,4,1030-1033. 1-Assistant Professor, Department of Anatomy, Bundelkhand Medical College, Sagar (M.P. ), INDIA. 2-Prof. &Head, Department of Anatomy, Bundelkhand Medical College, Sagar (M.P. ), INDIA. 3-Ex- Prof. & Head, Department of Anatomy, Gandhi Medical College, Bhopal (M.P. ), INDIA. Thyroid is a brownish red, highly vascular endocrine gland. It has got a very important physiological role in humans. It develops as a downward growth from thyroglossal duct and a part of this duct may remain patent leading to development of a fibro muscular structure called levator glandulae thyroideae. Its presence in humans is known but problem arise during surgeries of thyroid or structures nearer to it. Keeping this point in view, we conducted a study on incidence of levator glandulae thyroideae in twenty six adult human thyroid glands of both sexes. 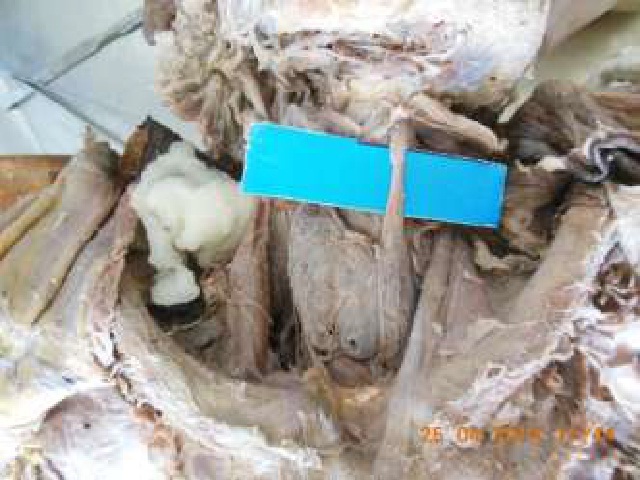 The entire samples were collected from Department of Anatomy, Gandhi Medical College, Bhopal and Bundelkhand Medical College, Sagar. Pyramidal lobe and levator glandulae thyroideae were present in 30.76% and 34.61% cases respectively. They were situated to the left side of midline in most of the cases. Knowledge about pyramidal lobe as well as levator glanduleae is very important during neck and thyroid surgery.